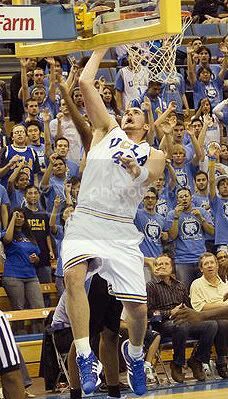 UCLA freshman Kevin Love was named the Pac-10 Conference Men's Basketball Player of the Week for November 19-25. He becomes UCLA's 46th Player of the Week all-time. Love averaged 18.0 points and 10.7 rebounds in the Bruin's three wins last week including leading the team to the CBE Classic championship while earning CBE Classic MVP honors. Against Maryland, Love scored 18 points and hauled down 16 rebounds, a UCLA freshman record, to help UCLA win 71-59. The previous freshman rebounding record was held by Jelani McCoy and JaRon Rush with 15. In the 68-63 win versus No. 10 Michigan State, Love poured in 21 points and grabbed 11 rebounds, recording his third double-double of the season. Against Yale, Love sprained an ankle and had to leave the game early but still managed to score 15 points and record 5 rebounds in the 81-47 win. Love practiced yesterday and is expected to start against George Washington on Wednesday. For the season, the Bruin center is averaging a double-double, 19.3 rebounds and 10.5 rebounds while shooting 56.1% from the field. He is also hitting on 37.5% from three-point distance. BBR Notes: The Bruins remained atop the ESPN/USA Today Coaches poll at No.1 this week. In the AP writers poll the Bruins are No.2 just points behind No.1 North Carolina.